Why do clients hire you? 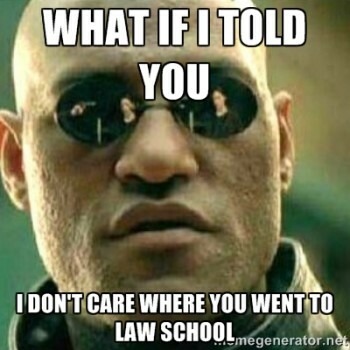 For most attorneys, it’s because the client felt some type of connection with the attorney before they set foot in your office. Whether it’s because a friend referred you, or because they heard you speak at a local event, a personal connection of some kind is still the best way to get a client. Video can be an excellent way to make that connection. Whether for a small presentation to prospective clients, your firm’s website, or an aggressive advertising campaign, video can help you expand and engage your audience. Even more importantly, although marketers everywhere are putting even greater emphasis on video in 2015, not many lawyers are on board. As Facebook, Twitter, YouTube, and even LinkedIn are stressing the power of video content, a lawyer doing it well is a trailblazer. 1) Determine what you want out of your video. 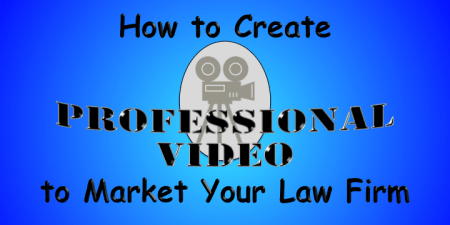 Your video isn’t going to market your firm on its own. It has to be a part of a broader strategy. Even on your website, you’re going to have different types of videos in your attorney bio page than elsewhere on your site. However, remember that these videos are for your potential clients. Think about your clients, particularly about what you hope they get out of your video. Make sure that you plan your videos around their interests, needs and behaviors. What good is a 20 minute instructional video for a client base that isn’t watching after 30 seconds? Plan your videos – their location, the subject matter, the length – based on providing the best value to the audience. Now that you know what kind of videos you want, you’ll have a better idea of what tools will be needed to do the job right. This part can get expensive if you’re not careful. The right tools make all the difference, and if you’re doing the video yourself, skimping on important tools will show. While you have plenty of video options, one thing I would never skimp on is an external mic. Regardless your video equipment, I can’t emphasize how much better your audio will be with an external mic! My preference is to have at least two different audio recordings to choose from. Get a tripod. It should probably be the first peripheral you get, and you’ll thank me. You probably also want to invest in artificial lighting. If you don’t have a room with good acoustics, you may want to check out a remote mic. If you’re really interested in having some fun, invest in a green screen. If you do, send me a video of you on a pirate ship! Another good tool is a teleprompter. Fortunately, you don’t need to shell out big bucks. There’s an app for that! Spend all you want on tools, they’ll go to waste if you don’t have decent software to edit the video. The right software will give you the ability to change the look, feel, emotion, and tone of your video. Adjust the image, add the right transition, mix in some music, and really give your video a professional feel. Once you know what videos you’re going to make, now’s when you get into the real nitty gritty. This is where it all comes together – where you find out if you know how to create professional video. First, outline your video, just like you would a speech. 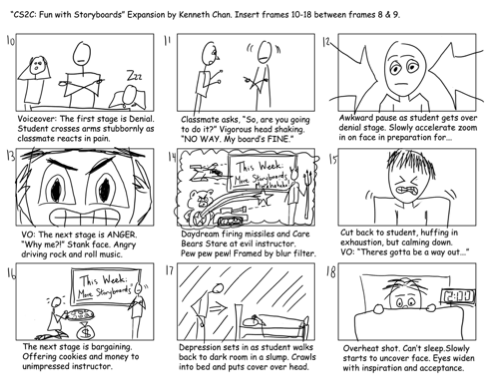 Now, before you start writing it out, you need to make a storyboard. We enjoy a good storyboard! Here’s why you need a storyboard: The outline you just made is probably based on how you would read about the topic. But video allows you to present the topic differently. Allow your storyboard to rearrange your outline to get the best visual presentation of your topic. Additionally, you can highlight where the video should be on your face, where you need to have shots of a computer or tablet screen, and what other changes you need to make. You’re ready to shoot. Before you start the camera rolling, though, a few things to check. First, do you have everything you need? Your props? Your equipment? Have you taken a look at yourself in the mirror to make sure that mustard stain is/isn’t on your tie? Once you start shooting, take a couple of lessons from Hollywood. First, always get a second (or third, or fourth) take. The more video you have to choose from, the better your final cut will be. Also, don’t be afraid of making mistakes. If you make one, collect yourself and keep going. Be creative with your shots! If you have a piece of software that you’re testing, do an entire take on the screen, so that you can insert cuts of the software in your edits. Don’t forget your audio! If you have more than one audio track, make sure that you’re using the best one. Editing projects can really be a lot of fun. Once you have the video you want, the last thing your editing software needs to do is format and publish the video. Make sure it’s the right size and the right format! So you have your video, finalized and ready to post. If the video is going on your firm’s website, you’re going to need a way for Google to index the video. Otherwise, nobody’s going to see it! You can publish the text of the transcript on the page, or use an app like Video Sitemap XML. I would also highly recommend hosting your video on YouTube or Vimeo. Aside from providing additional ways for your video to be seen, your site won’t bear the bandwidth of your video. Stay tuned for more details and tools to help you create some amazing videos for your firm.